Back in 2008, I went to the four-faced Buddha as I was establishing a new clinic with partners. At the same time, I was in search of true love. A few months later my business closed and I was still alone. However, there was a window in my life. Just when my business with my partners closed, my sole clinic at home started to work itself out. In 2010, I had to go back to Bangkok as I needed more supplies. I asked the vendors outside the Erawan Shrine how to do the whole prayer. They guided me. However, when I finished they asked for 10,000 baht! I was appalled and managed to bargain with them to pay just 4,000 baht. I agreed to this amount seeing the vendor was pregnant. In my mind, I said if my 4,000 baht can help her child, why not. In July 2011, I went to Bangkok to celebrate my birthday. I considered my prayers for business answered. My clinic though just humble is doing more than I ever expected. My prayer for love has yet to be answered. There is a magical attraction to the four-faced Buddha. If one feels, it, then it is for you. However, we always have to bear in mind that in our prayers and wishes, we always have to do what is right and be good to all. I brought some of my friends to the four-faced Buddha hoping that it could help their wishes and dreams come true as it did with me. I made a vow to the four-faced Buddha, I will always return and bring someone I care for, so that he can touch their lives, to live their lives well and do what is right. That way we can all live in peace. Faith and good deeds, result in dreams fulfilled. That is the magic of the four-faced Buddha for me. Hope this helps. Recently in May 2017 I visited Singapore and happened to be staying at the Ibis Bencoolen. Near this hotel are rows of different temples like Chinese, Buddhist and Hindu. However in this area is also a golden statue of the Lord Brahma (four-faced Brahma) where a lot of people from different faiths stop and bow and pray to him. I also did likewise and bowed with my hands clasped in prayer fashion to all the four-faced sides. On my return to New Zealand I have this strong feeling of bond with Lord Brahma as I prefer to call this holy deity. It is changing my way of thinking like I feel like becoming a vegetarian but then again asking myself can I just give up meat but still eat fish and eggs. I also have this strong longing to go to Singapore and offer my humble prayers to Lord Brahma again. Has anybody felt like this too? I will be good to hear from you. I found myself walking through the mall and ending up in the same Feng Shui store that I have become at home with. And just like that, the store keeper called, "Doc, Doc, remember the lady doctor you gave the four-faced Buddha pendant to?" Perplexed, I answered, "Yes I do". The store keeper added, "She came by here a few weeks ago and was looking for you. She tried calling your number, but she cannot get through. I replied, "Ah yes, I changed my number. So how is she? The store keeper said, "The lady doctor came by looking for you to thank you because she won the lotto!" My reaction was OH WOW!!! I am so happy for her at least that would help her in her financial troubles. I told the store keeper to give her my new number so she can call me. Nonetheless, I am so thankful to God and Erawan for helping that lady doctor, blessing her just when she needed it. I was at the Feng Sui shop in a mall and was looking at a Jatukam amulet. I asked the owner if it was okay to put Jatukarm with the four-faced Buddha. There was a lady doctor nearby and she asked me what worked for me. I told her about the magical story of the four-faced Buddha. She had problems; her parents had died, her mother-in-law is in hospital and financially, they were stretched. I saw the worry and sadness in her eyes. I chose not to buy the Jatukam amulet. Instead, I bought a four-faced Buddha for her as a present to wish her good luck. I taught her how I did my wishes. As she cannot go to Thailand, I told her to make her requests if the four-faced Buddha spoke to her. She was touched to tears. 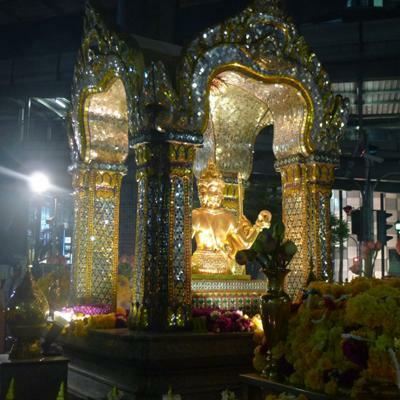 I told her if things get better for her, she can go to the Erawan Shrine for thanksgiving, when things are better for her, to help those in need. I went back to my clinic and was so surprised that at the end of the day, I had very good sales beyond my dreams. I am already a vegetarian and each day, I try my best to do some good for others, be it big or small. The magic of the four-faced Buddha does not stop as long as we keep our hearts pure with love and kindness. From what I have experienced today, the more I share with others, the more I get blessed. I share with others what I have and that is not only money but kindness and love as well. Thanks for taking me there as well, Sis! I've been wanting to pass by there everytime I find myself in Bangkok. This July 20 I'll be back in Bangkok. I'll be passing by there for sure and I'll surely remember you again! !